It is holiday in the UK and some other countries therefore GBPUSD will stay quiet. The support rests at 1.33350 with resistance at 1.33780 which the weekly pivot point at 1.33620 is located in between the lines. 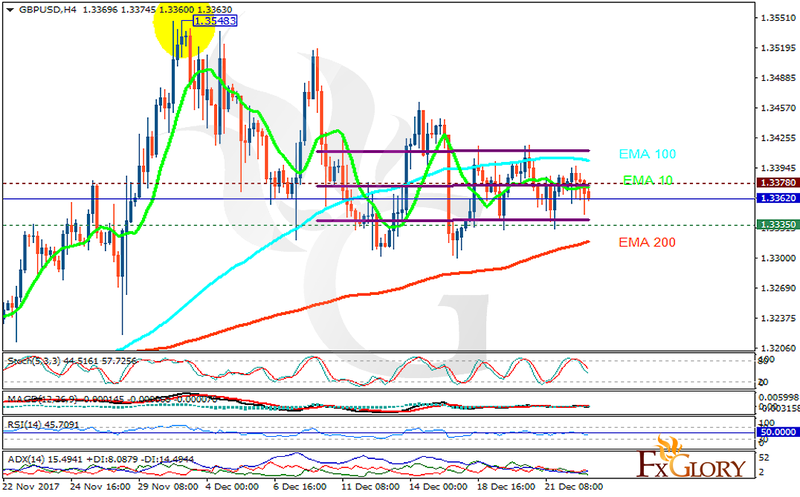 The EMA of 10 is moving horizontally in the channel and it is above the EMA of 200 and below the EMA of 100. The RSI is moving below the 50 level, the Stochastic is showing downward momentum and MACD line is on the signal line in the neutral territory. The ADX is showing sell signal. The indicators are showing mixed signals therefore the price will be fluctuating within 1.33 and 1.35 areas.